Papaya Punch Crème based vivid orange. 108 Degrees Flirtatious berry pink with specks of micro glitter. Senorita Bonita Passionate purple shimmer w pink micro glitter. 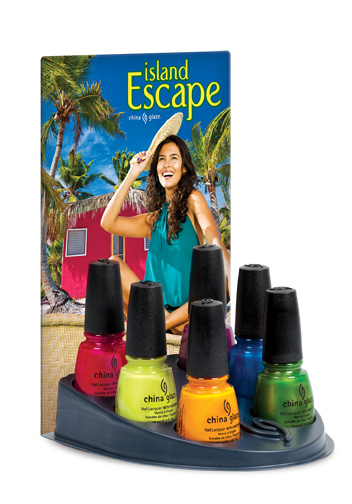 China Glaze nail lacquers are available through salons and professional beauty supply stores nationwide. For more information, visit: www.chinaglaze.com or follow China Glaze on Twitter: http://twitter.com/ChinaGlaze. Find them on Facebook here. Do any of these sound exciting to you? I am not a big fan of papaya the fruit, but Papaya Punch sounds awesome. NEW, Limited Edition Bronze Goddess Island Oasis EyeShadow Palette, $42.00. NEW, Limited Edition Bronze Goddess Sea Star Bronzing Blush, $34.00. NEW, Limited Edition Bronze Goddess Soleil Eau Fraiche 100ml, $55.00. Estée Lauder launches Bronze Goddess Soleil for Summer 2011, available early March. The collection consists of looks for eyes, lips, face and nails and a new limited edition version of Bronze Goddess Soleil the fragrance. NEW, Limited Edition ShadowStick Duo in Gold Bronze, $20.00. NEW, Limited Edition ShadowStick Duo in Pink Teal, $20.00. Pure Color Gloss in NEW, Limited Edition Sun Burst Sparkle, $20.00. Pure Color Gloss in Blazing Coral Sparkle, $20.00. Pure Color Gloss in Plum Divine Shimmer, $24.00. Pure Color Crystal Lipstick in Tiramisu, $20.00. Pure Color Nail Lacquer in NEW, Limited Edition Shimmering Bronze, $19.00. Bronze Goddess Soft Matte Bronzer, $30.00. Bronze Goddess Soft Duo Bronzer in Amber Bronze Medium and Amber Bronze Rich, $30.00. Limited Edition Bronze Goddess Luminous Liquid Bronzer, $28.50. I'm exited to try the Bronze Goddess Soleil Eau Fraiche fragrance. I picked up a previous year's edition and wore it that entire summer. It was light and effervescent. This year's editions boasts notes of Sicilian citron, Provençal lavender flowers, neroli Tunisia, Moroccan orange blossom, grapefruit tree blossom and pink lily nectar. It finishes with warm elements of blonde woods, iris notes, ambrette seed and crystalline musks. Sounds really pretty for warm summer nights!